After the Giants beat the 49ers in this season's NFC Championship game, word emerged from the Giants' locker room that the Giants had specifically targeted 49ers' punt returner Kyle Williams because of his concussion history. "the thing is, we knew he had four concussions, so that was our biggest thing, to take him out of the game." "Players are held accountable for their actions on the field. There were no illegal hits to the head or neck area to Kyle Williams on Sunday. There was no conduct by the Giants of any kind that would suggest an effort to injure Kyle Williams in any way." Accordingly, the league imposed no discipline. The NFL took the stance that Jacquian Williams' verbalized decree (that the Giants' "biggest thing" was to "take [Kyle Williams] out of the game") did not actually represent an effort to injure. To the NFL it was action that mattered, not rhetoric. Fast forward four months to player sanctions in the aftermath of BountyGate, and now the NFL has reversed course on their stated precedent. If players are "accountable for their actions on the field" and not for what they say and/or plan prior to a game, then how does the NFL justify the gaping disparity in the punishments dispensed with their statement after the NFC Championship Game? If the Saints were indeed running a three-year bounty program, where is the on-field evidence that supports those claims? By not punishing Vilma, Smith, Fujita, and Hargrove for on-field violations, isn't the league admitting nothing out of the ordinary occurred on the field of play? What it appears is that the NFL has harshly punished the Saints for running a pay-to-injure program in theory. Because, after all, the program never once realized its supposed goals. Again, this was an actual assault captured live that netted a five-game ban. Yet Vilma, who presumably offered $10,000 for knock-outs of Kurt Warner and Brett Favre (two games of allegations, not three seasons' worth), has been banned for an entire season. What this appears to prove is that in Goodell's increasingly-warped worldview, intended, unrealized malice is punished more harshly than actual, verifiable assault. Maybe the NFL is regretful for not handling the Haynesworth situation in a harsher disciplinary fashion, and apparently the manner in which they approach penalties in 2012 is different from the way they did so in 2006. That much seems obvious. But it seems even much more extreme when, yet again, the NFLPA released a statement in response to the penalties saying the NFL has not shared evidence with them, specifically citing "punishment without evidence." If I may be so bold as to speak for what seems to be a large portion of Saints' fans, this is what people are angry about: the league's continued public declarations of mountainous evidence and ascertainable guilt, coupled with their repeated failure to share evidence with the one entity (NFLPA) who can ensure some measure of due process in this festering imbroglio. If all of this is on the level as the NFL claims, then I don't think any reasonable person will argue that the Saints are guilty of punishment. What people rightfully have taken issue with here is the extremity of the penalties in light of: 1) the precedents set from prior statements and penalties disbursed by the NFL; 2) the lack of definitive evidence shared with anyone outside of Goodell's immediate circle and; 3) the glaring absence of any egregious, on-field malice. Should I also mention that the NFL's Director of Investigations who was leading the bounty investigations curiously resigned last Friday? (That was rhetorical). Make of it what you will, but his resignation and the timing of the announcement is nevertheless odd in light of everything else that has transpired. Regardless, the penalties still remain incongruous with the alleged wrongdoing. Why do you think the NFLPA has steadfastly held their ground that the NFL hasn't shared evidence? Are they repeatedly, publicly lying about this? 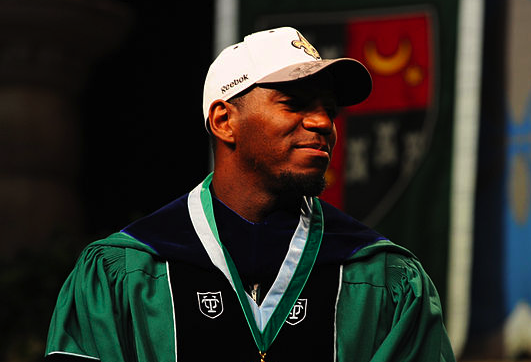 Why did Jonathan Vilma release a blistering statement, labeling the punishments an "injustice"? "I have never in my career, nor as a Captain asked others, to intentionally target and hurt specific opposing players. I was in no way involved in establishing or assisting Gregg Williams with implementing a bounty program. The accusations made against me are completely and one-hundred percent false, and I plan to appeal the decision along with the help of the NFL Players Association. Through this entire process, the NFL never notified me of what I was being accused of, nor presented me with any evidence or reasoning for this decision." So why do you think the NFLPA is threatening a "massive, multiple legal battle on several fronts"? Is it because the NFL's supposed evidence is so concrete and damning? Isn't the totality of refutations and denials enough to generate some relevant skepticism at this point? As I've stated before, why is it assumed that the NFL is beyond reproach here? We're still yet to learn anything beyond what the NFL has told us because the media that covers them is hopelessly bound by the shackles of indifference, and seems content to parrot instead of question. Do what you like, but I'm not taking the NFL's word at face value all things considered. The moment you blindly trust the word and motivations of a billion dollar corporation is the day you've lost. When Goodell states in his press release regarding player sanctions that the "facts ... have not been disputed ... by the individuals involved," he's being patently, embarrassingly disingenuous. If, as the NFLPA claims, the NFL hasn't yet produced any "facts," then how would it be logically possible to dispute them? Maybe, just maybe, there aren't very many facts to verify the existence of a three-year, pay-to-injure program. Maybe that's why the NFLPA hasn't received anything and maybe that's why Vilma and Smith have been adamant in their denials. Instead of continuing to cite "experts," "independent sources," and (oooh!) "forensics" to validate their claims of abundant and damning evidence, why won't the NFL simply share the evidence with the NFLPA and let us move along to bitching about Brees' unresolved contract situation? What Goodell officially punished the players for was "conduct detrimental to the integrity of and public confidence in the NFL." Hmm. That's funny. Because, you know, I was thinking the same thing about you, commish. About how, after the slipshod manner in which you've conducted this operation, I had lost total confidence in the NFL's ability to govern reasonably and transparently. I wonder, are you subconsciously projecting? That's what my dimestore psychoanalysis returns. What do I win? Good conversation with our trusty legal man @SportsLawGuy on the recourse the Saints players have now. The answer: Not much, past commish. Beyond the NFL appeal, with Goodell, the Saints players would have to prove the commissioner exceeded the scope of his authority in court. It's Goodell-said vs. Saints-said at this point, and we see how that's played out. For the most part though, this is all over now. Without much mercy, nonetheless. It's time to move on to another season of scorched earth, all in the name of Paytonian retribution this time. And as many people have pointed out, the absences of Vilma and Smith shouldn't be much of a hurdle to overcome. The defense is in the process of being revamped and the offense remains intact. Except for that Brees guy at the moment, but uh, Loomis is on it. The seeds of lingering discontent remain, and motivation will they provide. Far from debilitating the Saints' ability to be competitive in 2012, this offseason might, oddly enough, enhance that ability. It's high time for Goodell, that squirming dog, to finally have his day. How so? By handing Lombardi XLVII to Tom Benson in the Superest of Domes next February. OUR SAINTS shall rise up this season and be a force to be reckoned with this season. hell hath no fury like the who dat nation scorned. Thanks for this, you nailed exactly the points I have been trying to make over and over to every one I can, driving my entire circle of family and friends crazy and harassing espn and all nfl comment sections. Dont forget in 2009 Favre had a dirtier play than any Saint http://www.youtube.com/watch?v=KPgYKVO_1DE. I;m so glad there are people out there who can write these things so much better than I can!